Have you been subjected to unwelcome sexual advances by a co-worker or supervisor at your place of employment? Are you being pressured by a supervisor to engage in unwelcome sexual relations and been subjected to a change in the terms or conditions of your employment because you refused the sexual propositioning? Has your employer retaliated against you because you complained about his or her inappropriate sexual comments? If the answer to any of these questions is yes, you may have an actionable claim of sexual harassment under the New Jersey Law Against Discrimination. The New Jersey Law Against Discrimination prohibits discrimination at the workplace and in places of public accommodation. The New Jersey Supreme Court first recognized a claim for sexual harassment against an employer in the 1993 landmark case Lehman v. Toys R Us. Unlawful sexual harassment can occur in many different ways and in varying degrees of severity and pervasiveness. It can include things such as generalized gender based comments, inappropriate touching, grabbing, pinching, sexually suggestive or inappropriate comments and jokes, leering or staring at another's body, unwelcome sexual advances, a request for sexual relations, verbal or physical conduct of a sexual nature or retaliation for opposing sexual harassment conduct or participating in an investigation. There are several different forms of actionable sexual harassment under the New Jersey Law Against Discrimination, which include hostile work environment, quid pro quo and retaliation. the conditions of employment are altered and the working environment has become hostile or abusive. Many hostile work environment cases come down to whether the complained of conduct was severe or pervasive enough to constitute a hostile work environment. Under the "severe-or-pervasive" test, New Jersey courts have recognized that a single episode of harassment, if severe enough, can constitute a hostile work environment. New Jersey courts have not adopted a threshold magic number of harassing conduct or incidents but instead will review the totality of circumstances in determining whether an employer has created or permitted the existence of an unlawful hostile work environment. While it is possible that a single incident or comment can constitute a hostile work environment, courts remind litigants that it is still rare for one incident or comment to be enough to constitute an actionable hostile work environment. For this reason, a careful analysis of all the facts and circumstances of the work environment and the harassing behavior by an experience New Jersey sexual harassment lawyer is essential to access the viability of a claim for sexual harassment hostile work environment. the employee’s reaction to the harassment complained of affected the terms, conditions, compensation or privileges of their employment. A claim for quid pro quo recognizes the importance of preventing persons with authority from exploiting that power over their workers. Our laws recognize the importance of protecting people's employment from being impacted from persons who exploit their authority at the work place. Persons should not have to choose between engaging in unwanted sexual relations in order to keep their job to provide for themselves and their families. Employers have a legal obligation to assure that the managers and supervisors who are delegated power and authority in order to run a business do not use that power and authority to harm innocent employees. When employers do not have effective anti-harassment policies in place that stop or remediate quid pro quo sexual harassment, they can be found liable for the harm caused to the victim of sexual harassment. has or intends to file a complaint, testify or assist in any proceeding in connection with a sexual harassment complaint. An employee is protected from retaliation if he or she makes a complaint of sexual harassment or participates in an investigation of sexual harassment. If the employee is the person who complained about the sexual harassment, the complaint must be made in good faith and based upon a reasonable belief that harassment has occurred in order to be considered as engaging in protected activity. So long as the employee has made an objectively reasonable and good faith complaint of sexual harassment, the New Jersey Law Against Discrimination prohibits the employer from taking adverse employment actions against the employee for making the complaint. If the employee is not the complainant, but instead a witness, the standard to show that he or she has engaged in protected activity is lower. Simply participating in a harassment investigation is sufficient for a witness to be protected from unlawful retaliation. This is to assure that persons who are participating in harassment investigations, which often is mandatory, are provided strong legal protections against employers who threaten or terminate that person because of what they may or may not have said in the sexual harassment investigation. Once an employee shows that he or she engaged in protected activity, the court will then analyze whether the employee suffered an adverse employment action. Termination is the most obvious and straight forward way of proving an adverse employment action. However, retaliation can be found through other adverse employment actions that fall short of an actual termination of employment. The test for whether an employee has suffered adverse employment action is whether a reasonable employee would be dissuaded from making or support the charge of sexual harassment. This can include a demotion or transfer to a less desirable job position or location. It can also include a series of relatively minor actions that when viewed as a whole, can constitute unlawful retaliation. Like all other claims of sexual harassment, whether an employee has been subjected to unlawful retaliation is a fact-sensitive inquiry that should be reviewed by an experienced New Jersey sexual harassment attorney. The first step in analyzing whether an employer can be held liable for workplace sexual harassment depends upon the relief being sought by the victim of sexual harassment. An employer is strictly liable for equitable damages of a victim of sexual harassment. Equitable damages do not include money damages. They include non-tangible damages such as job reinstatement or stopping the harassing conduct. In these situations, an employer will be strictly liable for the sexually harassing conduct of its employees. In lawsuits where the victim seeks monetary damages, the standards of liability of the employer are different. In lawsuits for money damages, an employer can be liable for compensatory damages, emotional distress damages and punitive damages. In these cases, there are two different theories of liability which are vicarious liability under Restatement §219(2)(d) and negligence or recklessness under Restatement §219(2)(b). An employer will be found vicariously liable for the sexual harassment by a supervisor if the harassing supervisor acts on the employer's behalf and there is reliance upon that apparent authority or when the harassing supervisor was aided by the employer in his or her sexually harassing conduct. The test for whether an employer is vicariously liable for the sexual harassment of a supervisor is whether the employer delegated the authority to the supervisor to control the work environment; whether the supervisor exercised the authority provided to him or her by the employer; whether the supervisor's exercise of that authority resulted in the incident of sexual harassment; and whether the authority delegated aided the supervisor in harassing the employee. If the court or jury finds each of these questions in the affirmative, an employer will be liable for all the harm caused by the supervisor. The second theory of employer liability for sexual harassment is under the negligence theory. An employer will be found negligent when it breaches the duty of care its owes to an employee to provide a safe workplace free of sexual harassment and discrimination. An employer who has in place an effective anti-harassment policy can defend against a claim for negligence. Courts have made clear that "paper only" anti-harassment policies are not sufficient. In another landmark case Gaines v. Bellino decided in 2002, the New Jersey Supreme Court set forth five general factors that a court or jury should review in determining whether an employer has an effective anti-harassment policy. The factors are whether the employer (1) has formal policies prohibiting harassment in place at the workplace; (2) has formal and informal complaint structures in place for its employees to use in incidents of sexual harassment; (3) mandates sexual harassment training for its supervisors/managers and makes available for all other employees; (4) has effective sensing or monitoring mechanisms to check the trustworthiness of its anti-harassment policies and internal and external complaint structures; and (5) has made an unequivocal commitment from the highest levels of the company that sexual harassment is never tolerated and this commitment is demonstrated by consistent practice. In 2015, the New Jersey Supreme Court held that an employer will not be liable for workplace sexual harassment in situations where the harassment does not result in any tangible employment action and the employer can prove that (1) it exercised reasonable care to prevent and to promptly correct sexually harassing behavior; and (2) that the employee unreasonably failed to take advantage of preventive or corrective opportunities provided by the employer or to otherwise avoid harm. As a result of this decision, New Jersey employers are now more than ever encouraged to implement effective anti-harassment polices that prevent sexual harassment from happening and immediately stop and remedy the sexual harassment conduct when it occurs. New Jersey sexual harassment law is complicated and fact sensitive. 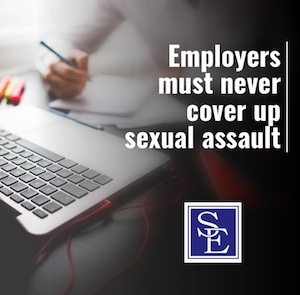 If you believe you are the victim of a hostile work environment, quid pro quo sexual harassment from a supervisor or unlawful retaliation because you complained of sexual harassment or participated in an investigation, it is imperative that you immediately seek legal counsel and advice from an experienced New Jersey sexual harassment lawyer. Our team of New Jersey Employment Lawyers have successfully litigated claims against small or big companies and are available to discuss the specific facts and circumstances of your potential claim for sexual harassment.